A new version of G&S Custom Work Drum Kits for Kontakt 5 Full (requires Kontakt 5.6 Full, will load in Kontakt Player only as a 15 minute demo). 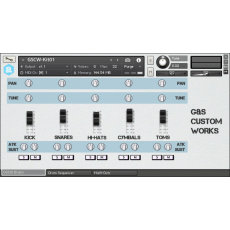 The new version of G&S Custom Work has an onboard Drum Sequencer with 32 selectable patterns. This download is free but if you use it and find it useful please consider a small donation (2-5 dollars suggested - but feel free).